(1827-1910) Born in New York City on February 6, 1827, Marple Sailed by clipper ship to San Francisco via Panama in 1849. He then mined for a while in the Mother Lode country around Placerville. Abandoning his pursuit of gold, he worked as a sign and house painter in that area and, as a self-taught artist, began painting landscapes. After moving to San Francisco in 1866, he established a studio at 432 Montgomery Street and in 1867 participated in a sale of paintings with several other artists including Denny, Holdredge, and Bush. In 1871 he was instrumental in founding the San Francisco Art Association and entered 36 pictures in the association’s first exhibition. The silver-gray effects of his paintings received favorable comments at the annual Mechanics’ Institute Fairs. Solomon Gump became his friend and patron, and in 1872 they opened a gallery called, “Marple & Gump’s Importers of Paintings.” Gump provided the financial backing and was exclusive agent in the sale of Marple’s paintings. During the 1870s, Marple was considered one of the top artists in San Francisco and was financially successful. In 1877, he left San Francisco for New York City and during 1879-1880 was active in Chicago and St. Louis where he was founder and director of the St. Louis Art Association. In October of 1880, he was in Colorado prospecting and painting with Harvey Otis Young. He died in Aspen, CO on February 23, 1910. 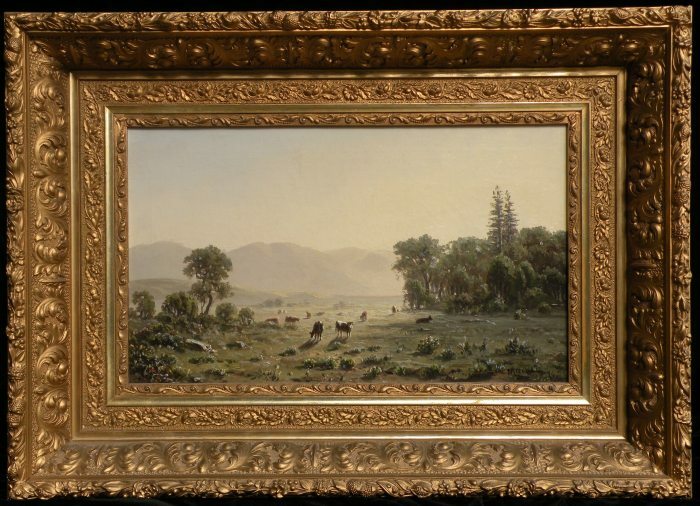 Works held: Society of California Pioneers; Oakland Museum; Crocker Art Gallery; California Historical Society.